Live it up in Vegas like a VIP on this nightlife tour that includes skip-the-line entry to some of the city’s hippest bars and clubs. 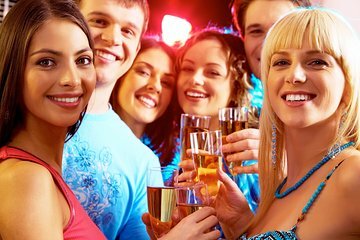 You’ll travel from one spot to another on a party bus that features an open bar, and then mingle and dance the night away with fellow partiers at venues like Tao or Body English. Enjoyed it . Pregame, partied on the bus and ended up in 3 different clubs. You get an idea and feel.of the night life. I celebrated my birthday this past weekend and OMG.... my girlfriends and I had the time of our life!! Our your guide was the best! He was very patient and lots of fun! Each stop was a blast! When I do come back to Vegas, I will definitely book this tour again and highly recommend it to others. I don't remember our Tour guides name but he was phenomenal!! We had a fun night on the party bus. Not very well organised. Had problems finding the host at the start as no board or anything saying who he was. Also when it says 'skip the line' we were still made to queue at each club. Altogether we visited 3 clubs so was good to have an overview as it was our first time in Vegas. The first bar had special happy hour offers on but beware the drinks are very expensive in most clubs 28 for 2 bottles of beer!! so factor that in if you have a budget and make sure you get your moneys worth of the included drinks on the bus. Amazing night meeting new people from across the world and experiencing what the nightlife of Vegas has to offer. Our guide Paulo was the perfect host ensuring fun was had by all. Would definately recommended Nocturnal Tours to my friends. Our group only rode in the party bus for literally not even 15 min .. also told us to leave the club earlier then original had been told .. not really worth it to me .. very disorganized! great night and great team. more info needed once inside venues. I enjoyed all the places we were taken to and the party bus was very fun! The ambiance and people were super fun to be around. Great Fun!! Wonderful host. You get to experience many different night spots.